Use simple office supplies in neon colors to decorate an inexpensive frame. This DIY frame makes great home decor, or even a bright gift! Well, I thought it could be fun to decoupage those little neon flags to something to create a pattern. So, I recently picked up a cheap wood frame at the craft store. I started to experiment with those items and some Mod Podge Super Gloss Formula that Plaid sent me last year. I love neon colors… in fact I dedicated an entire week to neon on my blog last year. As much as I like the brightness, I prefer to use neon in small doses tempered with lots of neutrals. I decided that a simple, white, chalkboard frame with a little bright color would be ‘just enough’ day-glow for me. Want to see how to make this neon DIY frame? 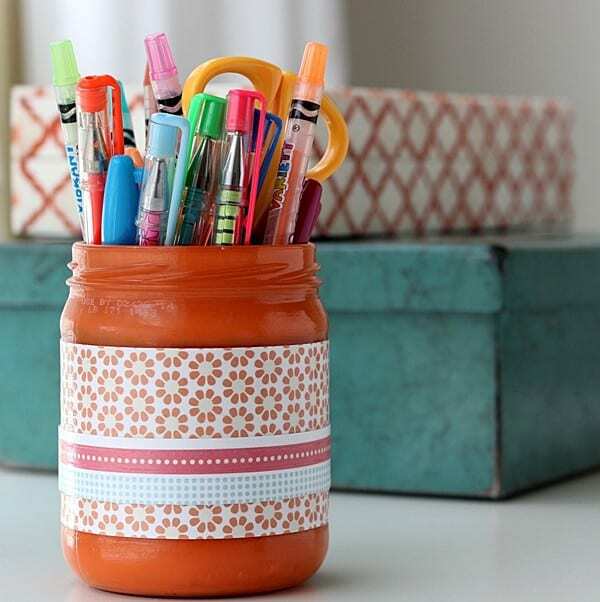 Raid your desk drawer and let’s get making! Remove the cardboard interior of the frame. Lightly sand down any rough spots on the wood and wipe it clean. Once the white paint is dry, use a small brush to apply neon yellow paint to the outside and interior edges of the frame. Take your self-stick flags and trim off the non-sticky part of the flag. Place them along the edge of the frame in the pattern you want with the adhesive down. I knew it would be difficult to get my pieces perfectly lined up (I’m not a very precise crafter, haha! ), so the staggered look you see is intentional. Note: I found that the self-stick adhesive held down the tabs securely . 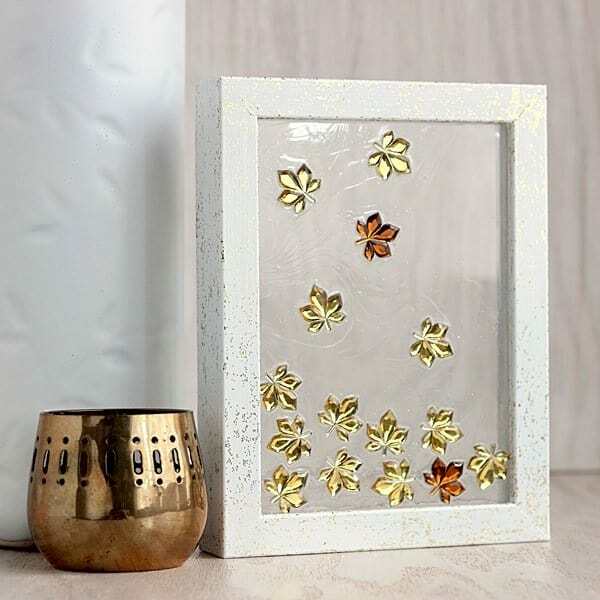 . . but if you think they might come up (Super Gloss is not to be used to glue things down), you can use a layer of regular Mod Podge over them prior to the next step. Now, get out a wide brush and your Super Gloss formula. 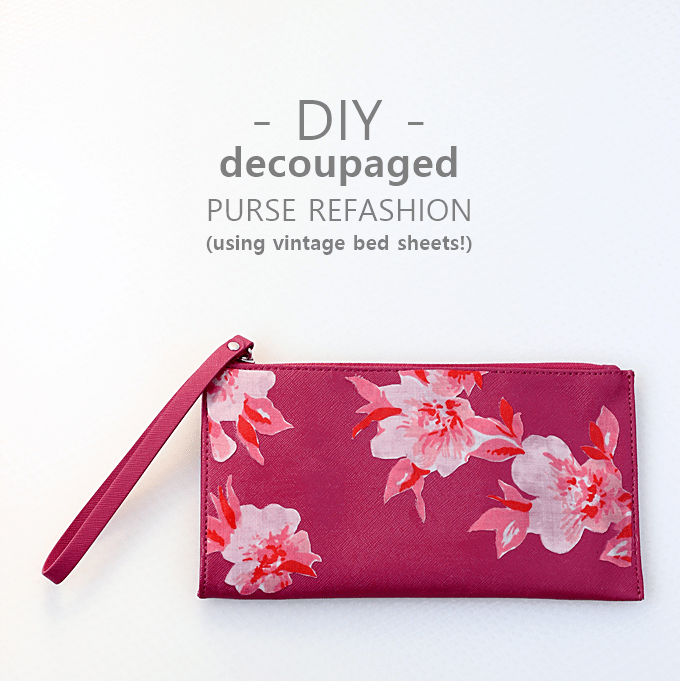 Brush on a thick coat of decoupage in one direction. Be sure to cover the neon flags and the sides of the frame. You can gently brush the Mod Podge while its wet in the perpendicular direction but do not overwork it. I repeat . . . do not overwork it! Leave the coating alone and it will self-level to a shiny gloss coat. To create a chalkboard, use the cardboard you took out of the frame as a template. Trace around that shape onto a thin piece of balsa wood. Cut out the square using scissors. Paint the square using at least 2 coats of chalkboard paint (allow it to cure before writing on it per the manufacturer’s instructions). Rub the side of a piece of chalk over the surface to ‘cure’ it. Write something fun on the chalkboard and pop it in your shiny and bright frame (or a photo, if you don’t want to make a chalkboard . . .). It is hard to tell in my photos . . . but with the Super Gloss formula, you will end up with a very shiny, hard coat over your surface. I think the sheen complements the modern white and bright colors of the frame. I’m glad I added the neon stripes down the side . . . the yellow color ties in perfectly with the yellow self-stick tabs! So, have you embraced the neon trend? It’s not hard or expensive to do . 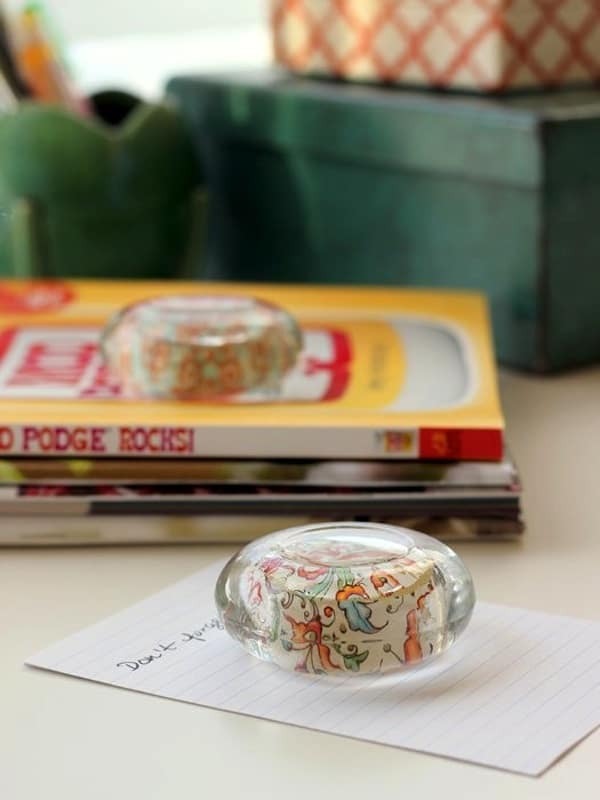 . . you just need some average office supplies and a little decoupage! 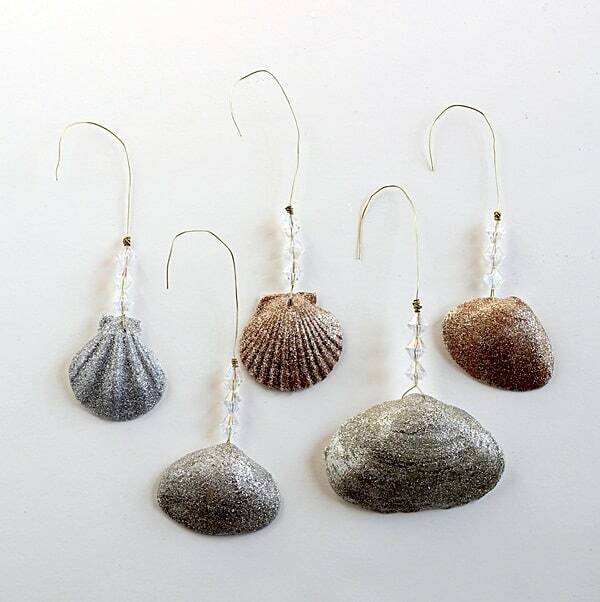 Glittery Seashell Ornaments the Easy Way! Just this week I painted a birdhouse white with neon pink dots and flowers….my husband thinks I am nuts…we shall see what the birds think!!! LOL! oooo that is a fun idea! I love using those post-its!! Nice! I actually have all the supplies on hand! I was wondering what to do with these frames!